Poppy Delevingne has made that crossover from modeling to acting which is why she was on the carpet for the 70th Primetime Emmy Awards this evening(September 17th) at the Microsoft Theater in LA. 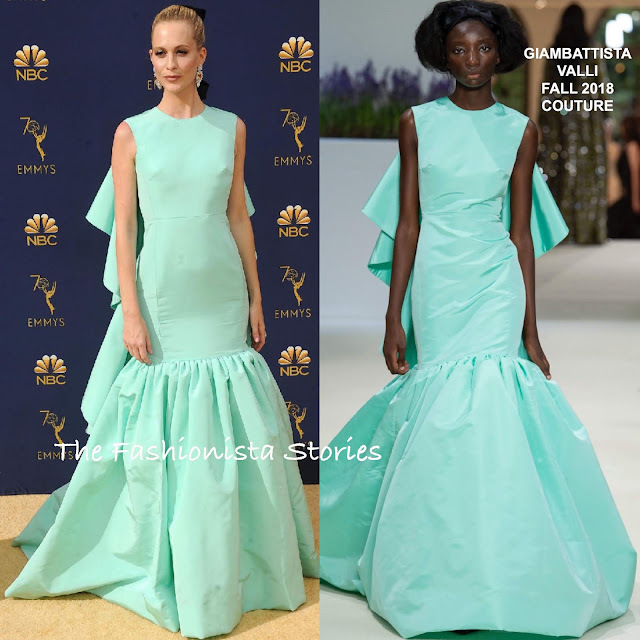 I am really happy that this GIAMABTATTISTA VALLI FALL 2018 COUTURE mint silk gown made it to the carpet, because it was one of my favorite pieces from the collection. While the color gives this gown a standout appeal, the cascading ruffles in the back enhances it. Even though it looks a little tight on her, I am still drawn into this look. A up-do which was adorned with a black ribbon and statement earrings finished up her look.